Detox teas have been highly debated and discussed in the health and fitness industry for quite some time now. These controversial herbal blends have gained popularity when brands such as Teami Blends and Fit Tea contracted high profile celebrity ambassadors such as the Kardashians, and Pretty Little Liars star Ashley Benson. Even reality TV personalities from the Teen Mom franchise jumped on board the tea train. Detox Teas are simply concentrated blends of herbs, spices, and extracts designed to cleanse one's organs, flush bodily systems, improve metabolism, and curb appetite. All in all reducing water weight, limiting snacking and calorie intake, aiding in weight loss. Such teas have been essential in my lifestyle for years. Just to freshen up my system every now and then. Like a massage or a facial, but for the inside. Though even more so recently as I restarted my postpartum health and fitness journey (follow my #MommyMuscles blog/video series where I document my progress, tips, workouts and more) I have been spiking my water with tea more regularly these days. Now even though popular detox tea blends have their handful of benefits they are not a one stop shop for health and weight loss. Just like any other supplement, it is best advised to use in conjunction with healthy diet and regular exercise. Also, make sure to check the ingredient list for any allergens and consult your medical professional before making a large adjustment to your lifestyle. So let's get into what you are all really here for and that is a list of the best and most popular detox teas for weight loss. I have not personally tried all of these teas, some, most, but not all. Though they are all highly recommended on Amazon with outstanding customer reviews. Make sure to leave your favorite detox / cleanse in the comment section below! 1.) Baetea is a delicious blend of traditional organic herbs that cleanses and boosts your metabolism and energy level. Helps get rid of excess water and reduces stress. Contains natural, beneficial ingredients to promote a feeling of fullness and suppress appetite while giving your body extreme nutrition with vitamins and antioxidants. This 14 day cleanse suggests steaping one tea bag in near boiling water every morning with food. 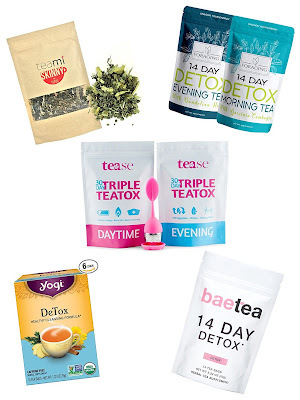 Baetea found a healthy and natural way to take your detox to the next level. With Organic Oolong Wu Yi and Organic Green tea to boost your body’s metabolism with the power of its most active ingredient called EGCG. Ingredients: Rooibos Leaf, Green Tea Leaf, Oolong Wu Yi Leaf, Ginger Root, Pomegranate, Guarana Seed, Matcha Green Tea, Garcinia Cambogia Extract, Natural Flavors, Lemon Juice, Sea Salt (Electrolytes), Citric Acid, and Stevia Powder. 2.) I have spoken about the Yogi teas and especially their detox tea before on my blog. They are super assessable as they are sold in most local markets. So no special ordering is required though you can get more and a better deal when ordered through Amazon. As everyday impurities find their way into our bodies, we may be left feeling tired or out of balance. Yogi DeTox tea combines time-honored cleansing herbs Burdock and Dandelion with Juniper Berry and an Ayurvedic blend called “trikatu” (Ginger, Black Pepper and Long Pepper), traditionally used to support digestion and circulation. Indian Sarsaparilla, Licorice, Cinnamon, Cardamom and Clove round out this delicious blend for a perfectly spiced tea. As part of an overall wellness program, Yogi DeTox tea helps bring healthy balance from within. 3.) This Foraging Tea is a 14 day two part morning and evening detox system. Specifically selected ancient herbs help to detoxify and cleanse the body. The morning detox has 11 essential herbs used to increase metabolism speed and curb unhealthy food cravings. The evening detox has 7 essential herbs used to eliminate toxins and strengthen immune system. Super herbs like Garcinia Combogia and Ginseng for managing food cravings and aiding in weight loss. This tea energizes during the day and relaxes at night. Special super herbs like Jiaogulan make you feel energised and focused throughout the day. While Chamomile and Lavender Flower relax you at night. 4.) Tease Teas are another two part detoxifying blend, but this detox bundle comes with the adorable tea infuser! OMG why do I think this is so stinkin' cute! Daytime blend is designed to be enjoyed every morning upon waking up. It is recommended to continue your light daily breakfast and lunch meal routines, this is not a meal replacement. Every evening, enjoy one cup of our evening blend. This will begin and regulate the process of cleansing out the digestive system and removing to detox the body. Now would this even be a detox tea post without talking about Teami Blends? Come on now. Even people who have had their head under a rock for the past decade now about Teami. If you are looking for an amazing detox tea that you can incorporate into your daily routine, this is the one for you! 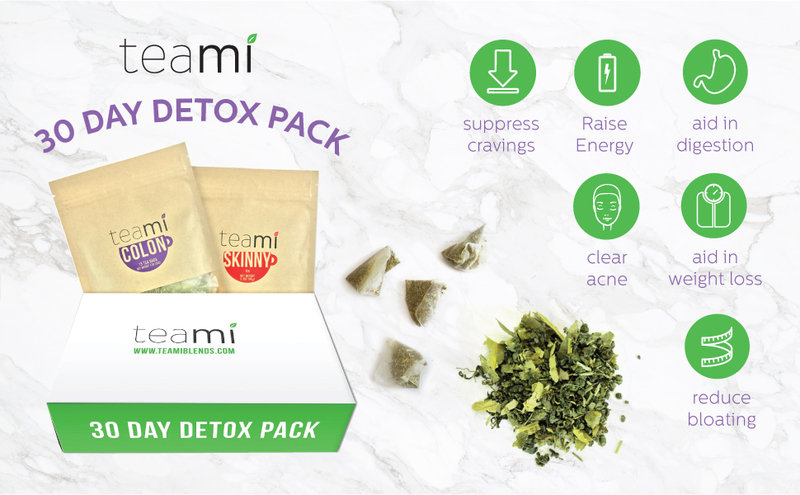 The Teami 30 Day Detox Tea will help you feel better from the inside out! Getting rid of the toxins that your body is holding on to will allow it to function properly, burn the correct amount of calories and have natural energy levels every day!